The Fourth Way, a new art/action collective committed its first action this past Saturday. 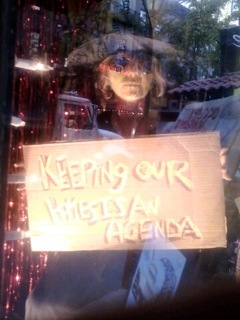 Occupy Windows took over the window of the charming Hourglass Tavern on 46th Street and 9th..using the theme that time is running out, Lady Nancledra, witch and seer, held placards that were noted and studied by the passer-bys who have yet to make it down to Occupy Wall Street. With the help of the Fourth Way graphic and animation department, this action plans on continuing in other venues all over the city. Please let them know if you have a window that needs to be occupied.